PEARL FASHION: 5 Wonderful Pearl Jewelry Pieces for the Spring 2014! Pearls are for EVERY season but these particular pearl pieces are a must-have for your Spring accessory box! 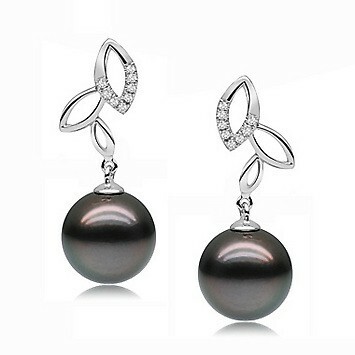 We selected these black Tahitian pearl earrings because as stated in the name, they are perfect for the Spring! The 14K white gold setting embedded with diamonds perfectly holds the black pearl in place to be marveled. Wear it day or night and all eyes will be on you effortlessly! Be super fly with these gorgeous butterfly Tahitian pearl earrings. These earrings are perfectly set in 14K Gold and embedded with small white diamonds; the 10-11mm AAA Tahitian Black Pearl earrings have a beautiful tint that makes the earring more precious. Give as a gift to a deserving young lady or gift yourself with this amazing piece and watch it become your favorite. Pair it with the matching pendant featured below for instant wow factor. We adore this gorgeous pendant because it is a part of our Ultimate collection. The Ultimate collection is finest and most-extensive line of top quality Tahitian cultured pearls available anywhere in the world. This delicate and dashing Butterfly Black Pearl Pendant is made for a very special lady. Set in 14K Gold and embedded with small white diamonds, the 10-11mm AAA Tahitian Black Pearl pendant has a beautiful tint that makes the pendant more precious. Give as a gift to a deserving young lady or gift yourself with this amazing piece and watch it become your favorite. Talk about making a lasting impression! Just like a flag that flows freely in the wind in the Spring, look fancy and free in these beautiful 9-10mm AAA Tahitian Black Pearl earrings set in 14K white gold with small diamond accents. These 10-11mm AAA Tahitian Black Pearls are all that you need to spice up your wardrobe this spring. This black pearl set in 14K white gold and 6 small diamonds sets the tone for a day or night filled with beauty and sophistication. Pair with a strand of black pearls and amaze onlookers. What do you think of these pearl pieces? Can you see yourself wearing them? This entry was posted in PearlsOnly Blog and tagged 2014, 5 Wonderful Pearl Jewelry Pieces for the Spring 2014, love, pearl earrings, Pearl Fashion, Pearls, pearls only by PearlsOnly Team. Bookmark the permalink.